The specified file public://inline-images/https_%2F%2Fs3-us-west-2.amazonaws (9)_5.jpg could not be moved/copied because no file by that name exists. Please check that you supplied the correct filename. Eurointelligence has an interesting on rising Italian yields, Italy's budget deficit, and the inability of the EU and ECB to do any thing about it. One of the lessons of 2012 is that rising spreads in the eurozone can create a self-fulfilling dynamic once they breach a certain (unknown) level. For Italy, we don’t think spreads have reached that point at the current levels of just above 300bp. But another 50bp or 100bp could trigger a crisis. A rating downgrade is certain, but the markets are watching whether the downgrade will come with a stable or negative outlook. If it is negative, Italian bonds would be on the brink of losing their investment-grade status. The nervousness is fuelled by defiant comments from Italian ministers. Paolo Savona said that, if the EU opts to reject the Italian budget, it will be up to the people of Italy to decide what to do next. This is where the situation today is so different from that of 2011 when an Italian president colluded with the ECB to remove Silvio Berlusconi. By then, Berlusconi had lost his majority in the chamber of deputies - and the support of the public at large. 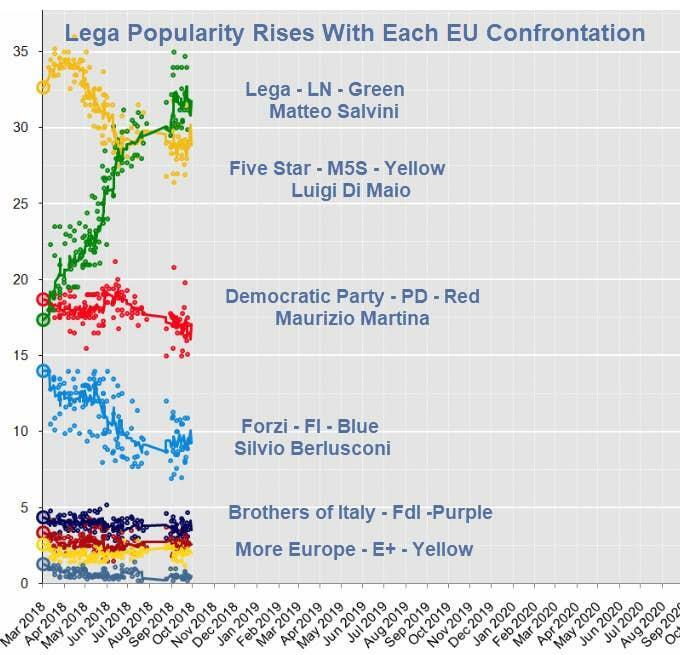 The Lega, by contrast, is currently seeing its support rise. And this continues with every row with the EU. It is therefore far from clear that a financial crisis would necessarily play into the hands of the EU and produce a more compliant Italian government, or at least a more compliant budget. The opposite might be the case. As of now, we see no signs of the Italian government backing down. There are good reasons to expect that the situation will come to a head at some point. Italy remains one of the eurozone’s slowest-growing economies. The IMF sees eurozone growth at around 2% this year, and a fraction less next year - while Italy’s growth is a little over half of that. The Italian government’s forecast of a falling deficit was premised on the idea of a fiscal boost generating higher growth. If that is not the case (it won’t be), the deficit is likely to rise above 2.4%. So we are looking at a return of the near-3% deficit and inevitable increases in the debt-to-GDP ratio. This is clearly not sustainable. We note a comment in Il Sole 24 Ore by Carlo Bastasin, who writes that Italy’s failure to achieve public-sector debt reduction during the short periods of relatively-strong economic growth means that the country is even worse equipped to deal with the next financial crisis than it was in 2008. The League and M5S pretend growth will be far bigger than realistic. The EU is willing to pretend as well because it does not want a confrontation with Italy on top of Brexit and confrontations with Poland over its judicial reforms and Hungary over immigration. Meanwhile, Lega continues to strengthen. This will come to a head sooner or later, sooner if yields blow out and later once Brexit is worked out by March.